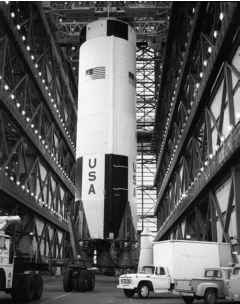 Apollo 8's first stage during stacking at Kennedy Space Center. 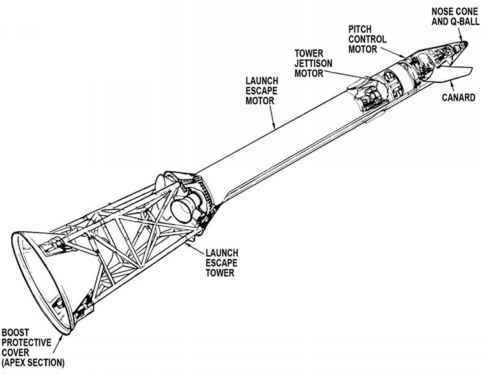 fuel called RP-1, similar to that used in jet aircraft, sat in the lower tank, while the larger tank above carried 1.3 million litres of very cold liquid oxygen (LOX) - a cryogenic propel-lant whose temperature had to be less than minus 183°C to render it liquid. Although these LOX tanks were huge, it was said that not as much as the residue from a fingerprint was permitted to be left on their interiors for fear of causing an explosion when LOX was pumped into them. 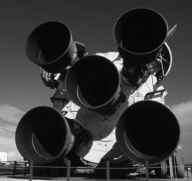 Five enormous insulated ducts from the LOX tank ran down through the fuel tank to feed oxidiser to the five engines.